Center Parcs marketed itself as the original “British holiday the weather can’t spoil”, but they are doing a pretty good job of spoiling holidays without the weather. 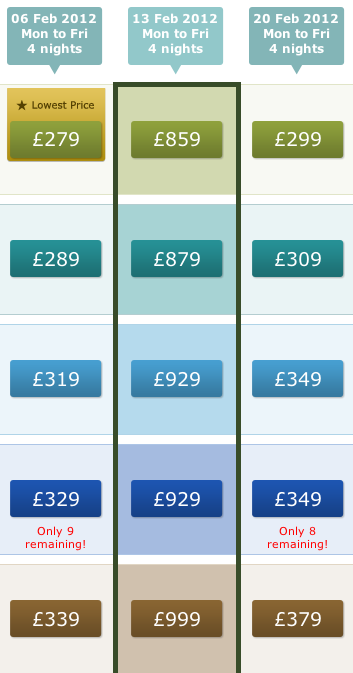 Consider the pricing matrix above. What could possibly cause the astronomical price hike in that one specific week? It’s the half-term school holidays. I do expect to have to pay a premium because of the school holidays. 50% would seem acceptable to me, but a 300% price hike? Even Michael O’Leary would find that hard to defend! I have studied Economics, I know all about supply and demand and differential pricing. The prices above do not seem to be not reflecting a shortage of supply however. There is no “only x remaining” in the middle week, so I can only deduce that the huge cost spike is a deliberate and cynical manipulation of the pricing model to take account of school holidays. While some families might bite the bullet and succumb to the exorbitant price tag, their stay must be tinged with bitterness at being financially exploited in this way. If you are being ripped-off so badly before you even arrive, what more do they have in store for you while you’re there? It’s not the kind of business that I would like to spend my money with. Center Parcs certainly doesn’t have a monopoly on this exploitative behaviour. It’s an industry-wide phenomenon which has been allowed to run wild. The blatant profiteering at the expense of parents and teachers is discrimination on a massive scale. Isn’t it time the UK Government acted on these unfair business practices? This entry was posted in General, Rant and tagged Center Parcs, half term by djh. Bookmark the permalink.